Face your day at full throttle! The PitStop GT Series Office Chair is designed to provide you with a comfortable and stylish way to cruise through your busy workday. PitStop furniture offers race-inspired design coupled with maximum comfort and functionality, allowing you proudly display your passion for motorsports while still effectively accomplishing your daily responsibilities. 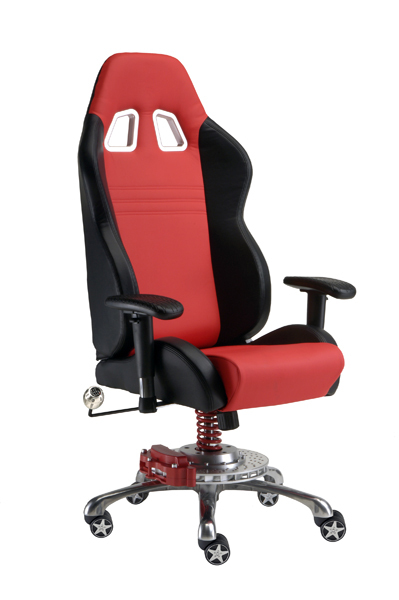 The PitStop GT Series Office Chair brings the best of the racetrack to your home or office. The PitStop GT Series Office Chair draws inspiration from the bucket seat of a genuine racecar. Each chair is bolstered for comfort and features padded tire tread embossed armrests that are adjustable to three positions. Racing shocks are featured on the armrests and central support shaft for added racing flare. The PitStop GT Series Office Chair boasts four ergonomic settings that are adjustable via an aluminum billet shift knob. A brake caliper kit base gives the PitStop GT Series Office Chair a true racing feel while a 26� wide track aluminum base offers stability. Five 22� style racing wheels give the PitStop GT Series Office Chair mobility as you maneuver through your workday. PitStop GT Series Office Chairs are designed and assembled in the USA from the highest quality materials available. PitStop Products are backed by an Intro-Tech Automotive, Inc. lifetime warranty. The quality in craftsmanship is evident in each piece of PitStop furniture.